Your last chance to enjoy the liveliness and excitement of the polo weekend before the season finishes at Dubai Polo & Equestrian Club. 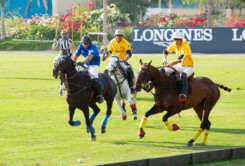 Watch the nation’s best polo teams battle it out. Polo brunch 1-4pm, Dh235 per person including soft beverages; Dh350 including house beverages, Dh110 per child (6-12 years), free for children aged five years and below. Silent disco after party from 7pm. Package prics Dh550. Call 04-3618111. Bringing their three-way performance to the shores of Dubai are Apollonia, with their underground heady music. Joining them is electronic music DJ Carl Craig, at Blue Marlin Ibiza UAE, Ghantoot Al Jazira Hotel. Doors open from 1-11pm. Free, guestlist advised. Call 056-1133400. Legends showdown, fans can witness the weigh-in event at : Town Square, Yas Mall, 6.30pm. Free to attend. Support the awareness of autism in the UAE tomorrow (Saturday), at Zabeel Park, Gate 3 from 4pm. Cultural heritage programme from 6pm. Registrations start at 3pm. Free. Dubai Outlet Mall is promoting holistic healthy living and total wellbeing today and tomorrow with free screenings in blood pressure, hair and skin analysis, blood sugar, diabetes screening, eye check, dental check and fitness demonstrations, 2-10pm. Baker & Spice’s Farmers’ Market at Bay Avenue packs in a treat for foodies, bringing fresh produce straight from local farms while head chefs from Taj Dubai host cooking demonstrations. from 8am untill 1pm. Start the day with a yoga session by the clear pools, relax in the cocoon beds surrounded by landscaped gardens and enjoy beverages and nibbles. As the sun sets, get in the mood with signature sounds playing into the evening. Every Friday from 10am–6pm, at Conrad Dubai. Dh199 per person including soft beverages, snacks, pool access and yoga, Dh299 includes house beverages. Call 04-4447444. Sunset brunch after party on at the Wet Deck, W Dubai, Al Habtoor City. Entertainment, and surprise specials, Wbrunch attendees will get two-fo-one on everything at the party. Free admission to all, starting 3pm. For guestlist email ahc.dining@starwoodhotels.com. Call 04-4366666. A fashion, lifestyle and wellness exhibition featureing on-site beauty sessions, makeup and nail art, designer collections, fashion shows, product launches and makeovers. At Za’abeel Hall 4, Dubai World Trade Centre, 12pm – 10pm, until tomorrow. modernwomanshow.com. The healing power of breath, a workshop suitable for those who want to gain experience of breathwork for personal development with a brief introduction to Taoist yoga techniques, with Dr Leila and Phil Edwards, at Holiday Inn Express, Safa Park, 6.30pm. Call 050-4745613. The 2017 theme ‘Cultural Heritage and Sustainable Tourism’ will offer entertaining and educational programme that emphasizes the local heritage. Activities include traditional dances, educational workshops, panel discussions and food truck stations. From 5-10pm, at Al Ain Palace Museum.